Your Family Dentist in Zionsville Says Oral Care is a Family Affair! As spring winds to a close, summer approaches and your kids start their break, you want to take the time to get the whole family together for dental visits. It would help tremendously, though, if you could find a professional with the skills to provide care for everyone. Your family dentist in Zionsville says you have the right thought process, and as you read on, you’ll learn how to identify the right professional to meet your family’s oral care needs. 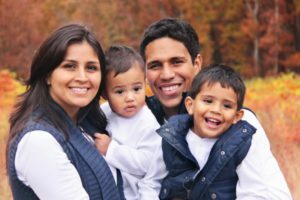 Is a Family Dentist the Right Choice? Experienced – It’s important for the dentist to be experienced when working with an entire family because the stages of oral development will be different, and the needs will vary. A seasoned dentist will have been exposed to various cases that he or she can glean knowledge from. Credentialed – Make sure that your dentist has been educated from reputable institutions. This will give you the peace-of-mind of knowing that your family is in capable hands. Versatile Care – Your dentist should be very versatile, offering an array of services. This is of great significance because it represents what should be one of the advantages of working with a family dentist – a one-stop experience for all your dental care needs. Warm Atmosphere – One of the more attractive features of working with the staff at Trinity Dental is that it is a family affair, as Dr. Julovich’s wife is also the dental hygienist. Therefore, you’ll have the comfort of bringing your family into an environment that promotes your lifestyle. Kid-Friendly – Finally, the atmosphere at your dentist’s office should be warm and inviting, especially for kids, who sometimes can be a little scared of the dentist. That’s remedied, though, by the staff and the dentist greeting them with big smiles and demonstrating patience. There are several benefits of finding that special professional who can provide care for the entire family. When you have a family of people at different ages and stages of oral development, it can be a daunting task to find a professional to work with each of them and to get them to their appointments. Thus, one of the greatest assets of a skilled family dentist is convenience, because you won’t have to drive around town trying to get everyone to their visits. Furthermore, working with one dentist provides stability for the whole family, and also helps your local professional spot any family trends based on genetics or lifestyle that could be corrected to provide better oral health. To get the peace-of-mind of knowing that your whole family is able to enjoy oral wellness, reach out to your Zionsville dentist to schedule an appointment today! For over 30 years, Dr. Angelo M. Julovich has been a fixture in the Zionsville community, providing expert and compassionate care to generations of families. Still, the graduate of the Indiana University School of Dentistry strives to improve and grow, which is why he maintains membership in several professional organizations. Dr. Julovich provides care for the whole family at Trinity Dental and can be reached for more information through his website.